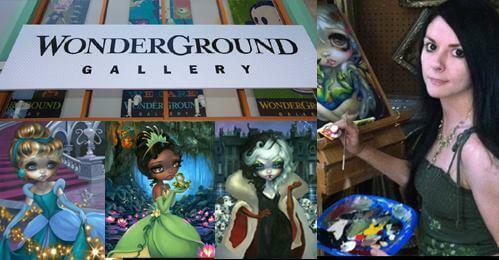 I’ll be doing two signing events with my NEW Disney artworks (“Cruella,” “Princess Tiana,” & “Cinderella Leaving the Ball”) in Anaheim at Disneyland’s WonderGround Gallery at Downtown Disney! Friday evening (March 8) and Saturday afternoon (March 9). This is a free event, no tickets/admission needed to access the gallery. All ages welcome! Downtown Disney® District is located at the Disneyland® Resort in Anaheim, California. WonderGround Gallery always has an assortment of my licensed Disney artwork, so – even if you can’t make it that weekend, my artwork is there all day 365 days a year. Live in Florida by the other Disney? Come & see my work too – at Pop Gallery Orlando next to the AMC theatres at Disney Springs West SIde, and also some specially featured Disney pieces at the Marketplace Co-Op inside the WonderGround Gallery section at Disney Springs Marketplace in Florida. I’m also at Epcot this year for the International Festival of the Arts. I do a lot of events in the Walt Disney World area throughout the year.